Content Copyright © 2012-2016 by Kushal.Mucon. All rights reserved. Every year, during the months of April and May, different villages in Kodagu celebrate an interesting festival called Boad namme. 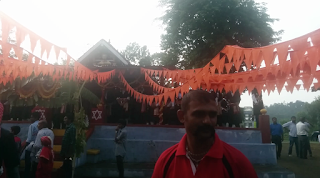 Usually these celebrations are associated with shrines of Bhadrakali. 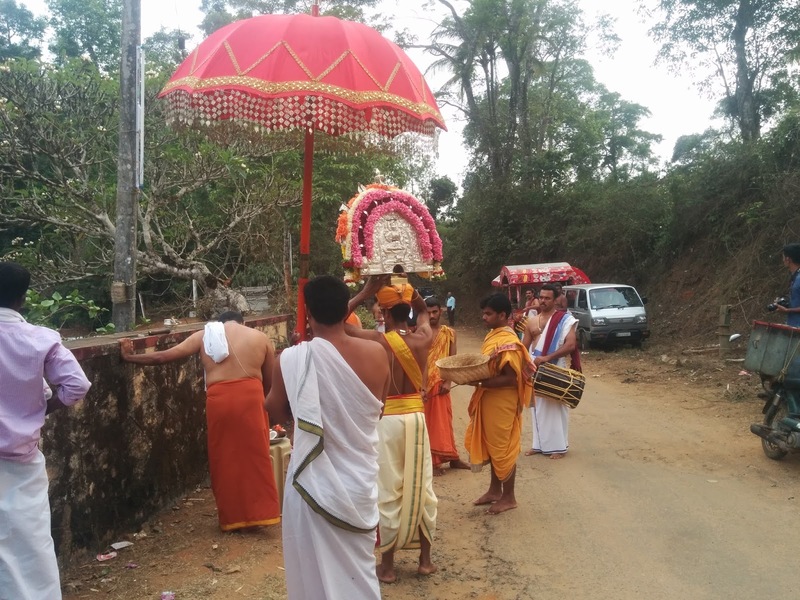 Residents of Chembebelloor (also called Chembebeliyur), Bilugunda and other villages roister around their respective temples on different days. The observances, however, begin with a stringent period called Pattani, when a number of foods (including those cooked in oil, using coconuts or non vegetarian), and certain common activities (such as cutting coconuts within the house), are prohibited. The revelry that follows has boys and men wear various guises and dance around the village. During that night and the following day, these performers masquerade accompanied by musicians who mostly play percussion. Going from one house to another in the village they bring vehicles on the roads to a brief pause. Some of the entertainers participate in Band Kali, where they have mud smeared all over their clothes, heads, arms and legs. 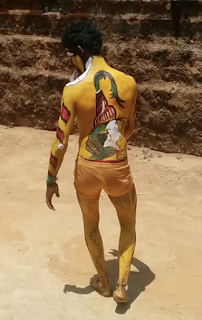 Some others, the Puli Vesha (tiger guise) performers, wear shorts and have their bodies painted in tiger skin patterns. When money is thrown at them they stoop down in impossible angles and with much care pick up the notes with their mouths instead of their hands. Many other enactments, including those by cross dressing males, are performed as well. The Chembebelloor Bhadrakali is west facing and there is a small Mahadeva shrine inside the temple. One performer carries the moga, a parasol with a mask upon it, of Bhadrakali and performs the theray. 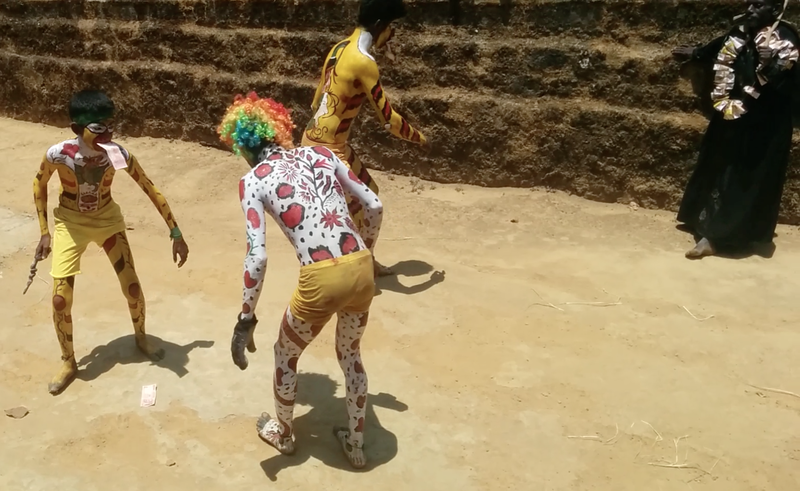 A theray, a sacred dance ritual by costumed dancers who emulate spirit deities, is organised at the shrine. 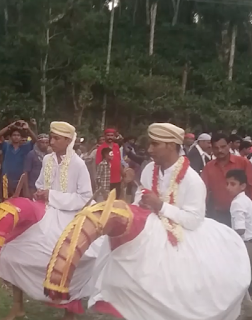 During the day of the Kudure aatta (horse play), teenaged boy representatives wear horse shaped cane frames around them. 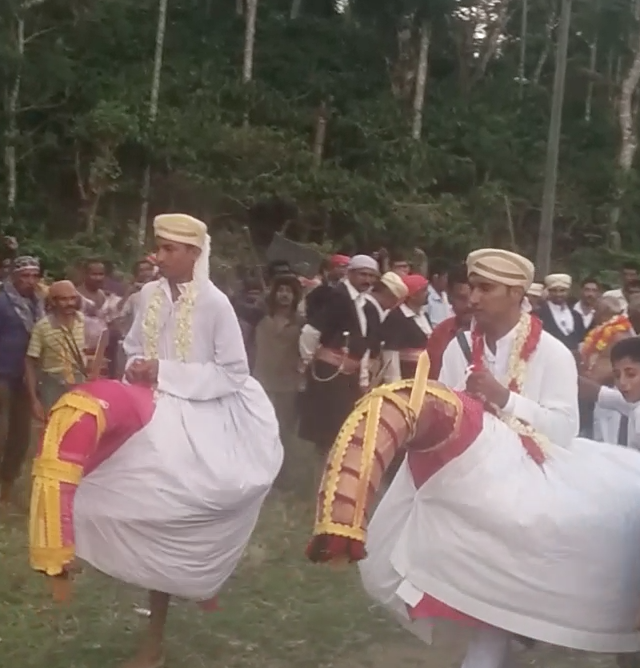 One horse performer comes from each of the three keri (hamlets) of Chembebelloor. According to Coluvanda Jappu, Chembebelloor village comprises of three keri : Podakote, Podikeri and Nadikeri. The villagers and the performers from each of the three keri all gather in the ambala, a public gathering place, in the centre of the village. 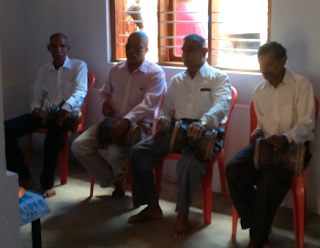 We were guests of Uncle Suresh Subbaiah's extended family in Chembebelloor last year. There was one performer, in black rags and a tin over his head, who called himself a bear. There was another who came guised as 'Black Money', dressed in a black robe and with money notes strung around his neck. Others included those in various priestly garbs; some of them came as saffron clad Sannyasi monks while one man came dressed as a Padri. Last time's attraction, however, was a set of men who dressed up as Spartans, in purple chitons and hoplite helmets with red coloured mock horsehair tufts on top. Folk singers from the Kundera and other families paid a visit. 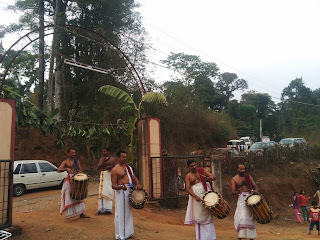 They sang the mane paat, a song in praise of the resident family visited, as they did in each house, while they struck on drums that they carried. John Napier, an Australian ethnomusicologist, was also present in the village to record the event. Later we went to the temple yard where we sat and watched with the rest of the villagers. 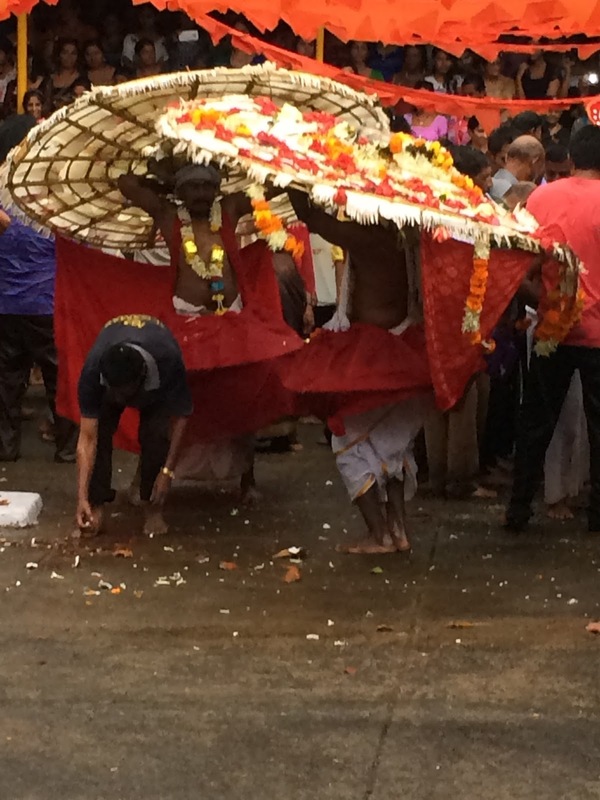 Some villagers with leafy twigs kept in their shirt collars entered the temple at the head of procession, as per tradition. All the actor and musician performers entered the shrine after them. 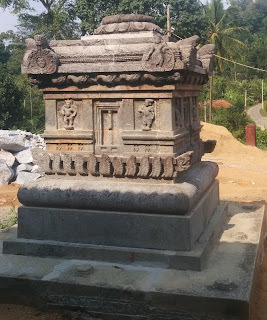 The Bhadrakali temple of Bilugunda is in what was the village of Bonda and now between the Bilugunda and Nalvathokkal villages. It is south facing and has two entrances: one leads to the south and the other to the east. 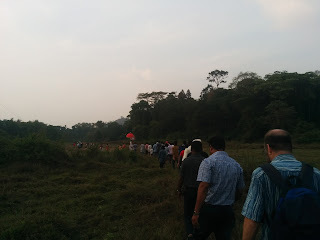 During the Bilugunda Boad namme, the people from Bilugunda enter from the east while the people from Nalvathokkal enter from the South. One year the dand theray, or two theray, happens and the next year the naal theray, or four theray, happens in Bonda. During the dand theray, as in last year, Bhadrakali and her sister Karikali are impersonated while during the naal theray the two daughters of Karikali, one of them being incapable of speech, are also emulated. 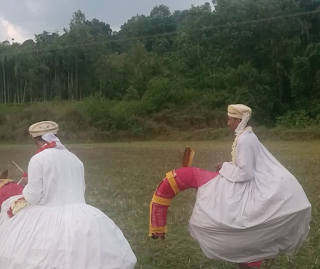 The Bonda theray performers dress in white panches (sarongs) around which are tied red skirts that are held up by canes. Upon each of their white turbaned heads they hold up flat wooden framed white umbrellas each of which have flowers and a metal mask of the fanged goddesses. At the back of this parasol hangs a red cloth. The chief oracle wears a white panche, is independent of the theray and is called a Thiralekara. 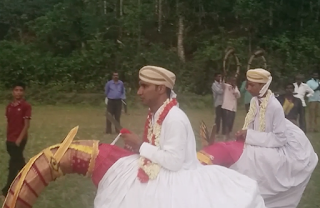 One horse performer comes from Bilugunda and one from Nalvathokkal. The nine extended families and eighteen houses of Bilugunda take turns every year to have a teenaged boy become the horse performer and a younger boy dress as a woman. Traditionally the horse and the woman performances happened on separate days but now due to time constraints they are being combined to happen on the same day. The Bilugunda horse performer last year came from my paternal great grandmother's Madappanda clan house. Mandepanda Dali and other folk singers sat within the Madappanda house and sang the Dudi paat as some of us listened. 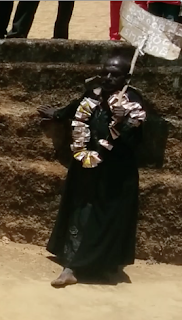 Last year's Nalvathokkal performer belonged to my maternal great grandmother's Bonda Mukkatira family. 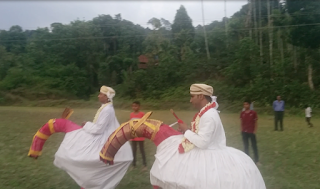 The horse performers wore white coloured turbans, long shirts, trousers and horse frames. They were accompanied by a procession comprising of their respective family and village members. 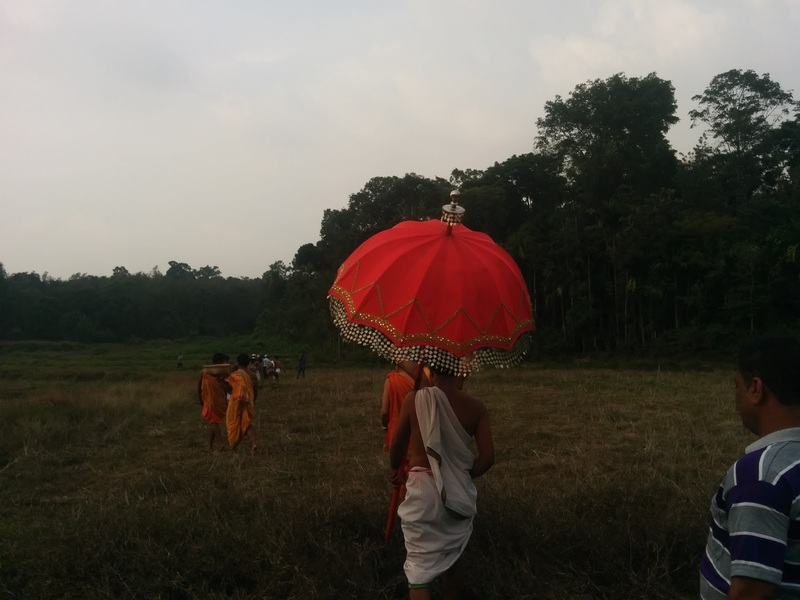 A Thiralekara walked before each performer while another man carried a native Oide Katti war-knife and walked beside him. Two other men carried dudi drums and sticks. A young girl carried a lighted oil lamp on a plate. 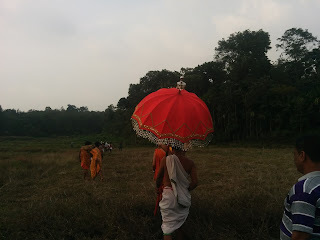 A small boy from Bilugunda, who, as an exception, was from the Iynanda family, was dressed in a simple red sari. In his hands were held a mirror and a betel leaf and he walked behind the horse performer. A woman of the house accompanied him in order to help him with the dress if required. 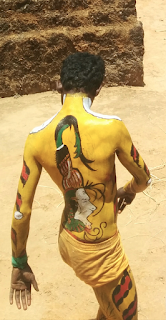 Likewise there was another young boy from Nalvathokkal as well. Both horse performers came and stood before the shrine in front of the fire altar. Then they raced twice on fallow fields, once in Bilugunda to the east of the temple and the second time in Nalvathokkal to the west of the temple. Once they finished the races they returned to their starting points, by walking rapidly backwards each time. Meanwhile the two small boys who dressed as women were made to stand on either side of the temple door. 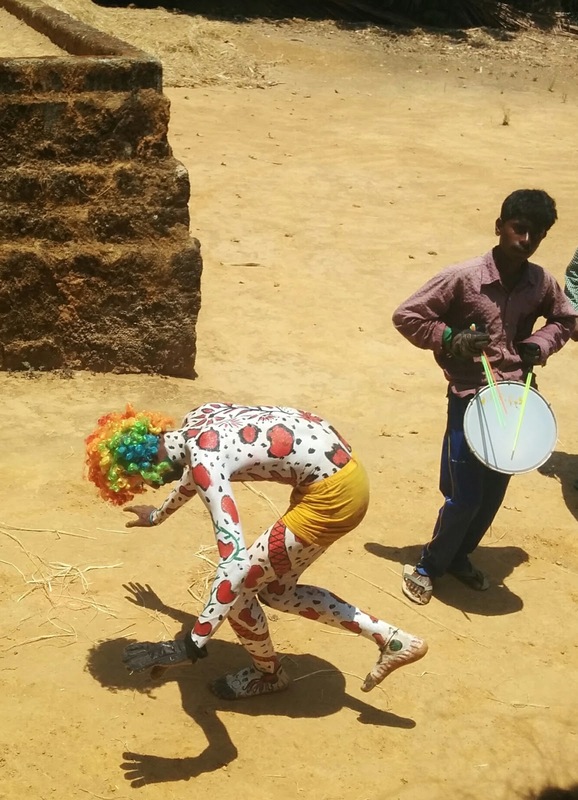 In Bilugunda there were some performers who dressed up as army men and some as Yakshagana dancers. 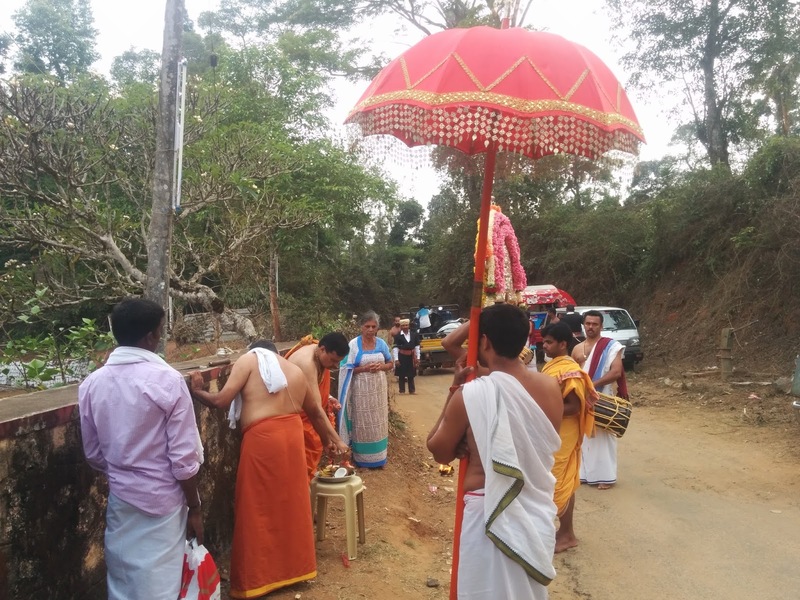 Edmyaar Ond (the first day of the Kodava month of Edmyaar), is the New Year for the Kodavas. This year, the day falls on April 14. 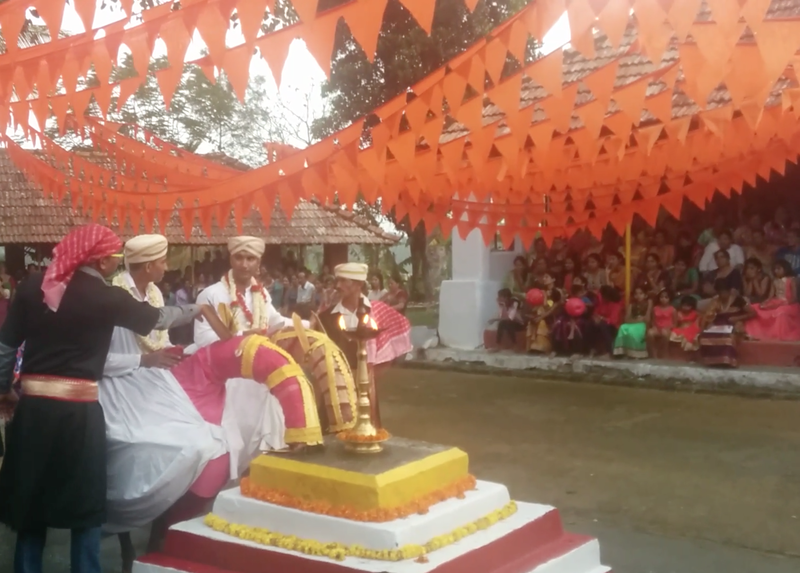 It marks the commencement of the Kodava calendar and the agricultural cycle in Kodagu. 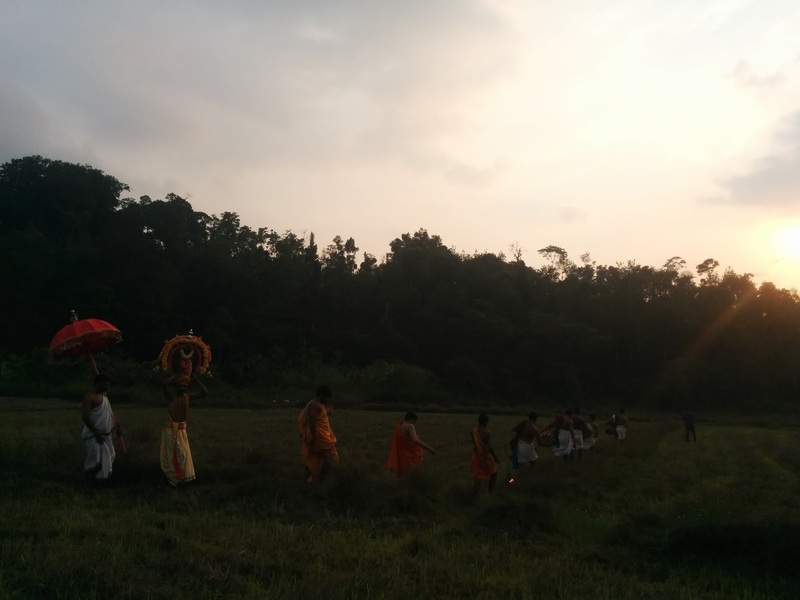 On this day prayers are said and cattle are yoked and made to plough the paddy fields. Bisu Changrandi, the Kodava New Year’s day, corresponding to Vishu in Kerala and Vaisakhi in North India, is observed in mid-April. Also called Edmyaar Ond, Bisu commences when the sun seems to enter the first Zodiac sign of Aries. Kodavas follow the solar calendar, which was the same as the Tulu, the Malayalam and the Tamil calendars, although the month names differed. While Kodagu and Dakshina Kannada followed the solar calendar, the rest of Karnataka followed the lunar calendar. The months of this lunar calendar begin and end with a new moon. 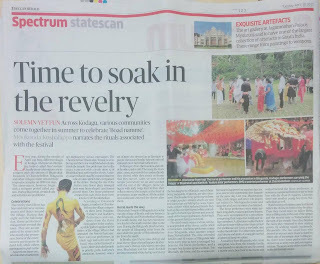 There is a reason as to why Kodavas now celebrate Ugadi and not Edmyaar Ond. The Rajas of Kodagu (c.1600 – 1834) came from the Shimoga region to Haleri in Kodagu. They followed the Hindu lunar calendar and implemented it in Kodagu for all administrative purposes during their reign. 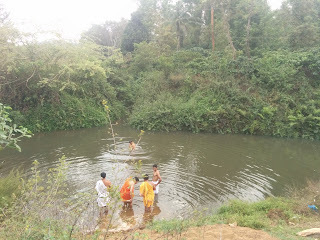 Their chief festivals were Ugadi, Shivarathri and Ayuda Pooja (Dasara). 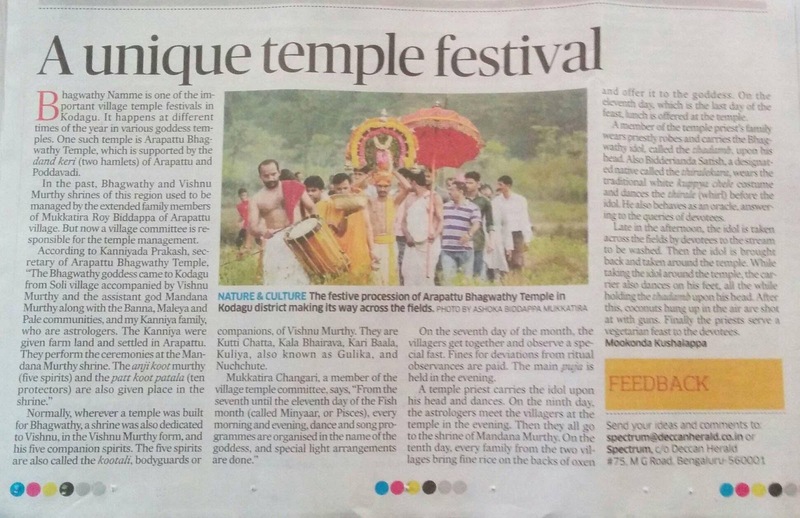 Thus these Hindu festivals were popularised in Kodagu. Ugadi, when Bevu-Bella (neem leaves and jaggery) is eaten and mango leaves are hung upon doors, also happened to be a major festival in neighbouring Mysore. 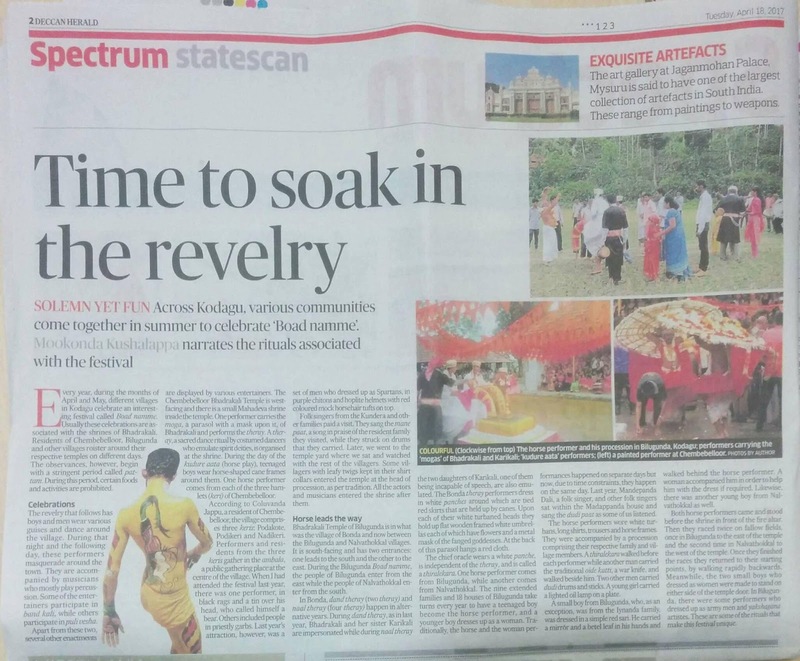 The event is showcased well by the present-day Kannada media. The influence of the neighbours and of the media has increased the popularity of the festival. As Kodavas moved out of Kodagu to live in the cities, Edmyaar Ond, observed in the fields, is no longer celebrated by them. 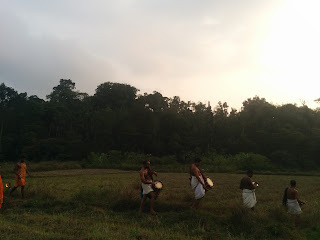 The disappearance of paddy fields and oxen has led to the further neglect of the festival by Kodavas. Therefore, the significance of Edmyaar Ond faded while Ugadi gained prominence. 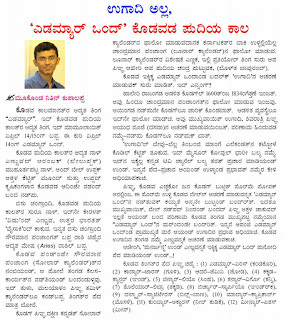 Presently Kodava political outfits have been trying to popularise Edmyaar Ond in Kodagu once again. The months of the Kodava calendar and their corresponding Indian zodiac signs are : Edmyaar (ram), Kadyaar (bull), Adare (twins), Kakkada (crab), Chingyaar (lion), Kanyaar (maiden), Tholyaar (scales), Birchyaar (scorpion), Dalmyaar (archer), Malyaar (crocodile), Kumbyaar (water bearer) and Minyaar (fish). There are a number of village temple festivals as well in Kodagu. 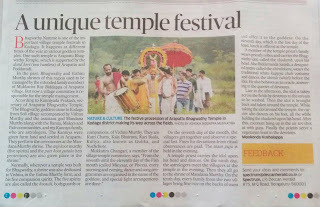 The major festivals are the Bhagwathy namme and the Boad namme, associated with the Mother goddess temples. While the first is celebrated in the Bhagwathy temples the second is celebrated in the Bhadrakali temples. These happen at different times in different village temples. I attended as a guest of my uncle Mukkatira Roy and cousin Ashok. Traditionally Arapattu village had fifty families and Poddavadi village had ninety families. The Arapattu Bhagwathy temple is supported by the villagers of Arapattu and Poddavadi, known as Dand Keri, or two hamlets. In the past, the Bhagwathy and the Vishnu Murthy shrines of this region used to be managed by the Mukkatira family of the Arapattu village, as it is said that the temples were on their lands. But since some decades ago the management is by a village committee. 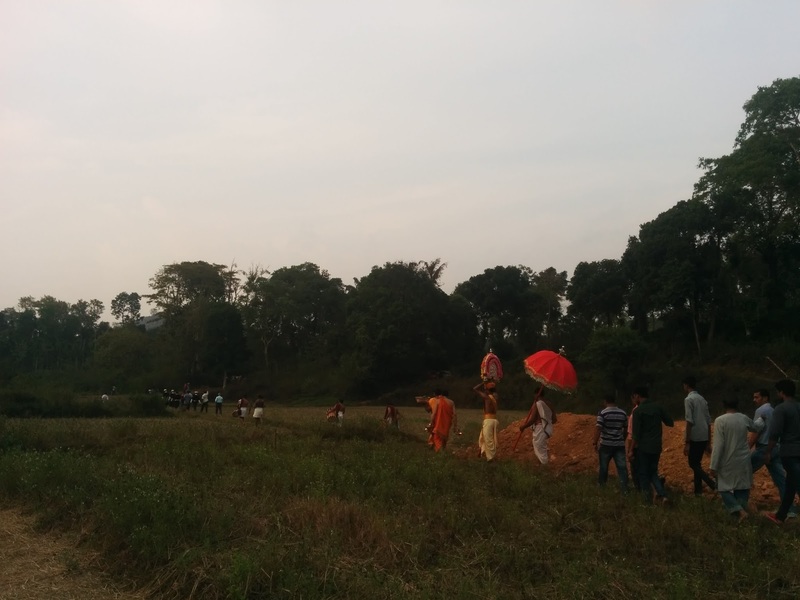 Nerpanda Chitra member of the Arapattu Bhagwathy temple committee was supposed to manage the festival affairs but since there was a death in his family he didn't, as per custom. In his stead another member of the village temple committee, Mukkatira Changari, presided. Mukkatira Changari had this to say on the last day of the feast, “From the seventh until the eleventh day of the Fish month (Minyaar or Pisces), every morning and evening, dance and song is conducted in the name of the goddess, special light arrangements are done, people come for the Darshan and offer money, flowers and tilak of sandalwood paste are distributed and then finally everyone disperses home. On the seventh of the month of the fish, the villagers get together and observe a special fast. Fines for deviations from ritual observances are paid and the main Puja is held in the evening each day. 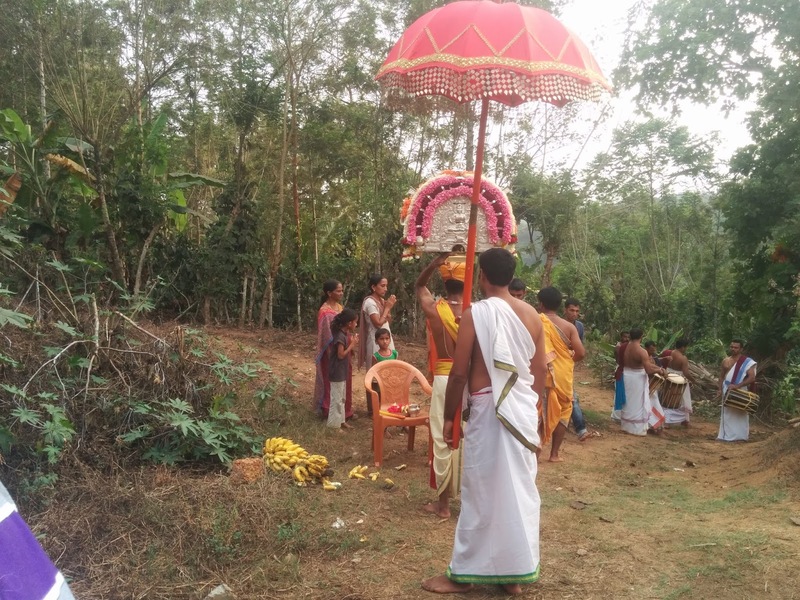 A temple priest carries the idol upon his head and a dance occurs. 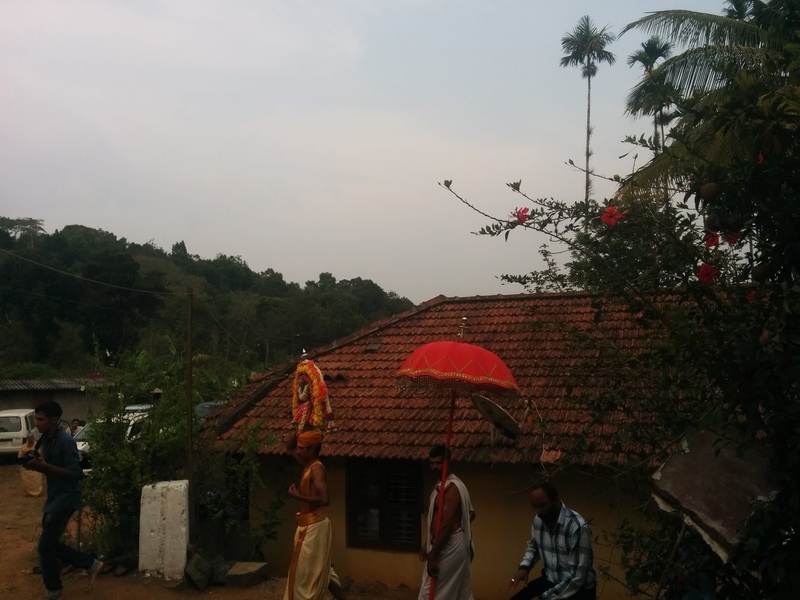 On the ninth of the month, the astrologers meet the villagers at the temple in the evening. Then they all go to the shrine of Mandana Murthy. On the tenth day, every family from the two villages, brought fine rice on the backs of the oxen and presented it to the goddess. On the finale day of the week long festival, lunch was offered at the temple. A member of the temple priest's family wore the priestly robes and carried the Bhagawathy idol, called the thadamb, upon his head. 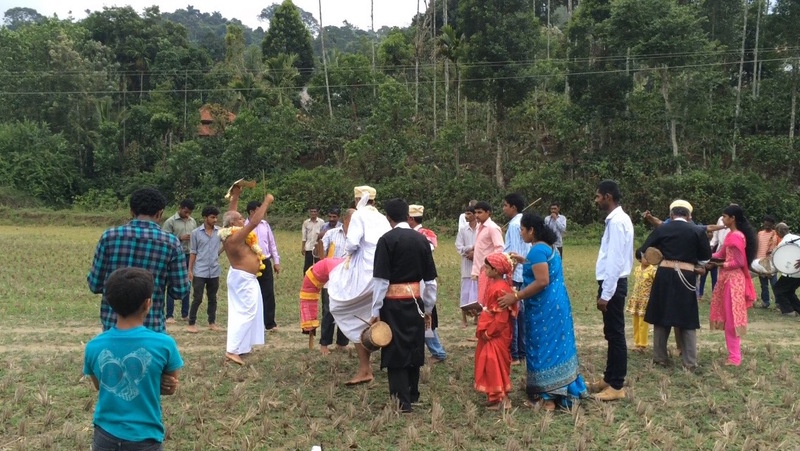 Bidderianda Satish, a designated native called the Thiralekara, wore the traditional white Kuppya Chele costume and danced the thirale ('whirl') before the idol. He also behaved as an oracle, answering to the devotees queries. Late in the afternoon, the idol was taken down, across the fields and by devotees on foot, to the stream to be washed. Bisi Bele bath was offered to the accompanying people. Then the idol was brought back and taken around the temple. While taking the idol around the temple the carrier also danced on his feet, all the while holding the thadamb upon his head. After this coconuts hung up in the air are shot at with guns. Finally the priests served a vegetarian feast for the devotees. 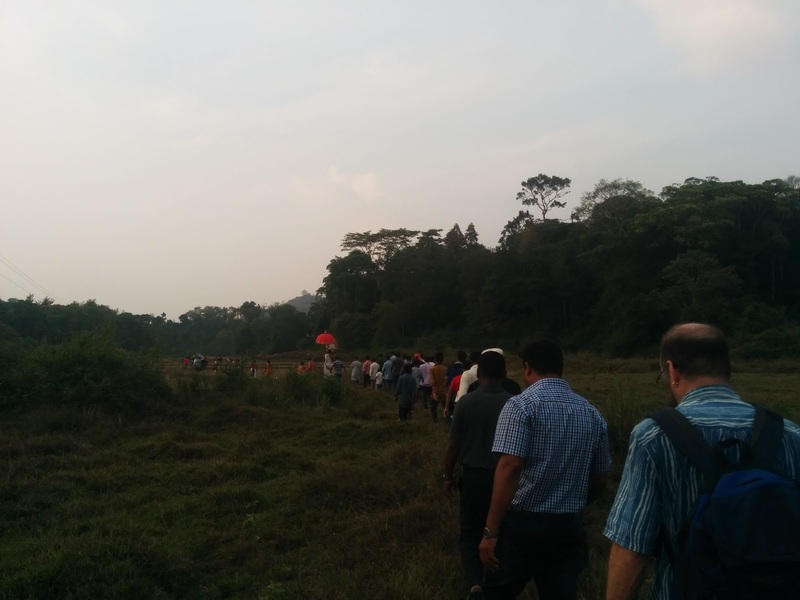 Dr. John Napier, an Australian ethnologist and guest of Balyameederira Subramani of Arapattu, recorded the events of the last day. Normally wherever a temple was built for this Bhagawathy a shrine was also dedicated to Vishnu, in the Vishnu Murthy form, and his five companion spirits. The five spirits Anji Koot, are also called the Kootali, bodyguards or companions, of Vishnu Murthy. They are Kutti Chatta, Kala Bhairava, Kari Baala, Kuliya, also known as Gulika, and Nuchchute. Each of them have some peculiarities. 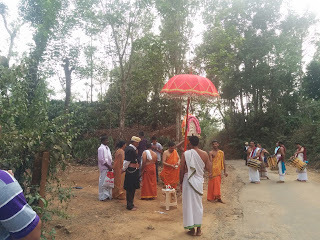 According to the Pattole Palame , the worship of Choli Povvadiamme (Soli Bhagwathy) in Kodagu was first established in Kirundad village, then in Arapattu and next in Kokeri. 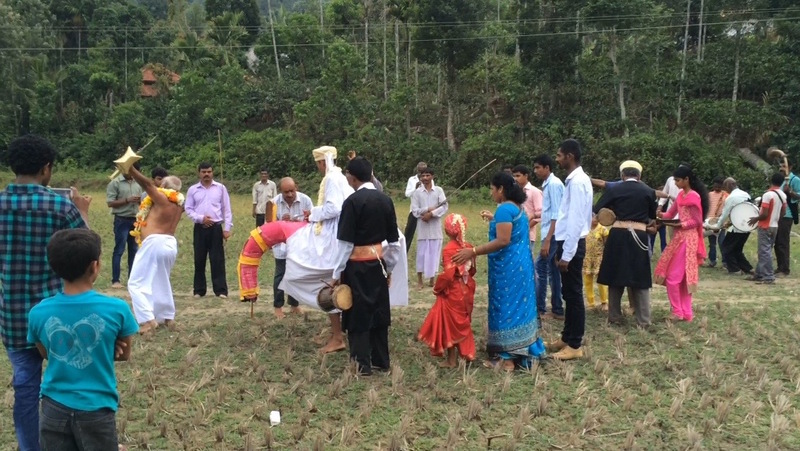 Thereafter the worship was begun in several other villages of the region as well. Three individuals find mention as having assisted the worship, an astrologer Movayi Kaniya and two shamans, Anata Banna and Manat Maleya, who settled in Arapattu, Podavada and Kirundad respectively. The Pattole Palame is a compilation of the folk songs of Kodagu by Nadikerianda Chinnappa. 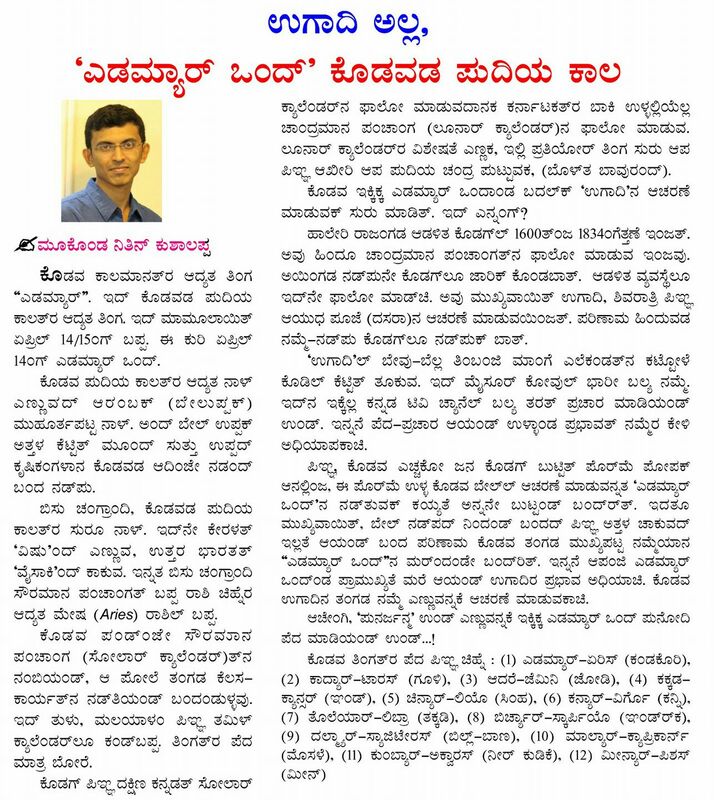 Published in Kannada in 1924, it was translated by his grandchildren Bovverianda Nanjamma and Chinnappa into English. 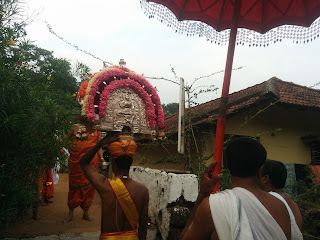 In the past a folk hero Kayyandira Appayya of Arpattu and his successors, chiefs of the Kayyandira and the Bidderianda families, would wear the white Kuppya Chele and be carried in a palanquin to the Arapattu Bhagwathy temple during this festival. The practise was however stopped many years ago. 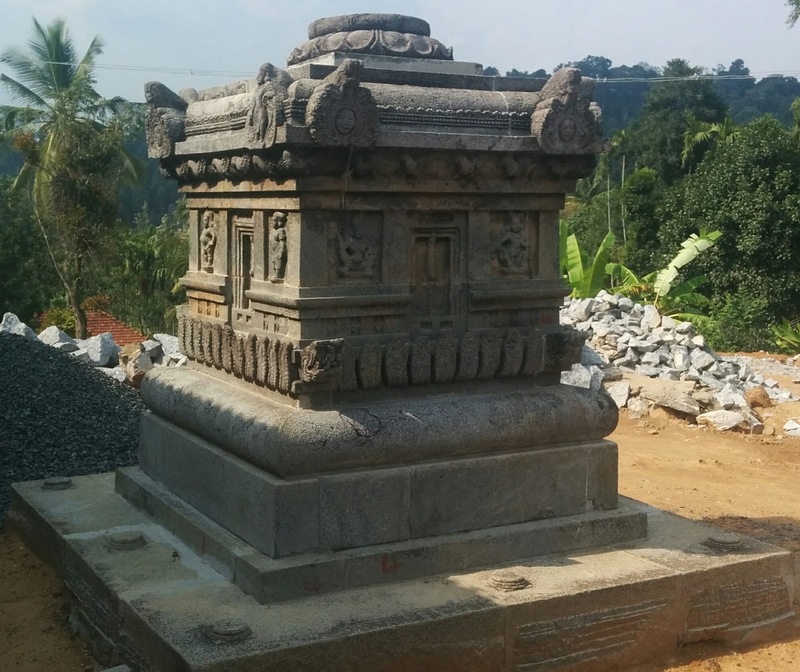 It is said that once Kullachanda Chondayya of Ammathi was the undefeated warrior champion of Kodagu. 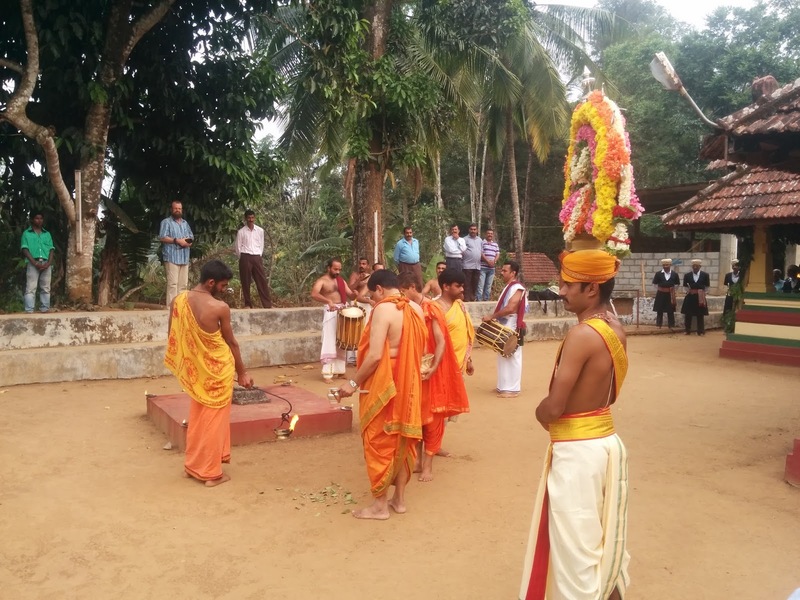 He received tribute obtained from the regular share people gave to the village temples. But one day Kayyandira Appayya, a young boy at that time, challenged him to a duel. 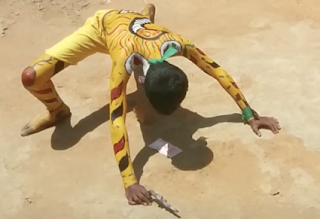 In this Appayya outwitted Chondayya by throwing mud into his eyes. When the warrior was momentarily stunned, Appayya slew him. Thereafter Kayyandira Appayya and his successors received the title of Periya Moli.